The short answer is yes. So, the reason you got orthotics in the first place, is to realign the feet in its proper position. This is a position where all the bones and joints are in alignment. Most foot problems are due to biomechanical disturbances. This means that when you walk, your feet move out of position and move too much in one direction. This leads to numerous foot problems with some of the common ones being tendinitis, plantar fasciitis, neuromas, bunions, and hammertoes. Once you stop wearing the orthotics, the foot will go back to its abnormal position. This is like eyeglasses. If you stop wearing your glasses, you will not be able to see. You notice it immediately. However, with orthotics, it might take weeks to months before you notice any problems from not wearing them. Thus, we suggest you continue to wear your custom inserts in the type of shoes they were made for. 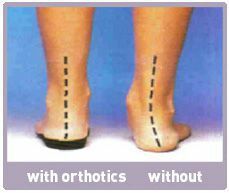 Orthotics commonly last 3-5 years, so if your inserts are around that age or older, it is best for you to come in and get them evaluated.